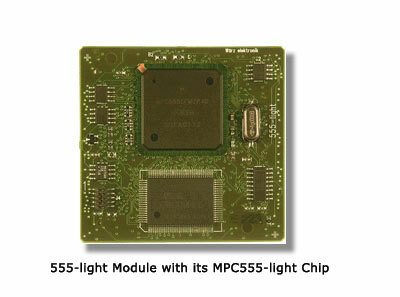 The module 555 light made by Würz elektronik is a 61x58 mm sized module with the Motorola processor MPC555. The MPC555 is a RISC MCU with a 32 bit PowerPC architecture and integrated floating-point unit. The processor of the MPC555 operates at 40 MHz. 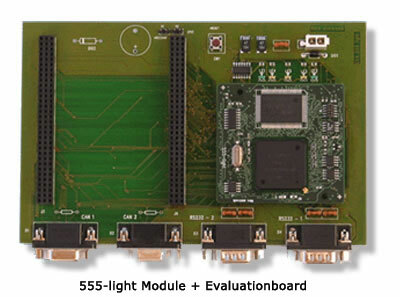 The design intention of the module, sized 61x 58 mm, was a stand-alone solution for costeffective embedded applications. The module has no external Flash-EPROM only the internal Flash is supported. The module supports 1 MB synchronous burst SRAM (32 bit), two RS232 drivers, two CAN transceiver with rates up to 1 Mbps an a serial EEPROM on the QSPI. A 10 pin debug interface (BDM) can be used to program the internal Flash via debug software. All processor signals are accessible on two connector pins (spacing 0.8 mm Type: HARWIN M60 ). The module is also available for an extended temperature range as an option. Single 5 Volt Power Supply.